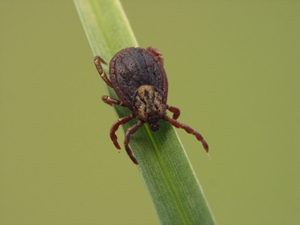 Spring is here…and so are the ticks! Home » Spring is here…and so are the ticks! With the weather finally warm, and most of the snow already melted, spring is in the air; and that means that the ticks are likely already out, searching for food. Most people think of ticks as nasty little insects who bite us, and our pets; but beyond the biting, they can also spread disease – so it’s important to consider taking steps to keep your pet, and yourself, free from ticks. Dogs, in particular, are frequent victims of tick bites, especially if they love to spend time outdoors in grassy or wooded areas. At Gardiner Park Animal Hospital, we have several products available which can help keep your dog free from ticks and the diseases they potentially carry. Our most popular options are oral medications, either given once a month, or once every 12 weeks. We also have topical medications, applied to the skin once a month. The best choice for your dog will depend on their age, size, and the activities you expect them to engage in outdoors. If you’re not sure how to choose the medication that’s right for you and your dog, our staff will be happy to discuss the options with you. Just call the clinic 306-721-1022, or come down and pay us a visits. While many people find ticks disgusting, even terrifying, remember they are manageable, and we’re happy to help you on your way to a fun and tick-free outdoor season.